England's Alastair Cook scored a century in his final Test innings on Monday. ONE-HUNDRED-AND-THREE men have scored centuries on Test debut. Thirty-five have scored tons in their final Test. Only five have scored centuries in their first and last Tests. On Monday Alastair Cook joined that club, making 147 against India at the Oval in the final Test innings of his career. Twelve years ago he began his career with an unbeaten 104 against the same opponents in Nagpur. Australia's Reggie Duff was the first to pull of the double. In 1902 he began his career with a second-innings 104 batting at No.10 and three years later he finished it with a first-innings 146 opening the batting. They were the only two centuries of Duff's 22-Test career. It would be another 29 years before another man achieved the feat, with Bill Ponsford pairing his 110 on debut against England with a double-century in his farewell Test in 1934. Fifty years later Greg Chappell (108 v England in 1970, 182 v Pakistan in 1984) made it a club of three, and in 2000 India's Mohammad Azharuddin (110 v England in 1984, 102 v South Africa in 2000) became the first player outside of Australia to achieve the feat. Cook joined the club on Monday with some help from India's Jasprit Bumrah. Having cut Ravindra Jadeja for a tight single, Cook was gifted another four runs by an errant shy at the stumps from Bumrah, which raced away to the ropes, taking the England opener to 101. Alastair Cook and Joe Root both scored centuries on Monday. The left-hander was given a lengthy standing ovation from the Oval faithful and by the time his 141-run innings came to an end he had lifted himself to fifth on the all-time Test run-scoring charts, sandwiched between Sri Lanka's Kumar Sangakarra (12,400 at 57.40 across 134 Tests) and India's Rahul Dravid (13,288 at 52.31 across 164 Tests). 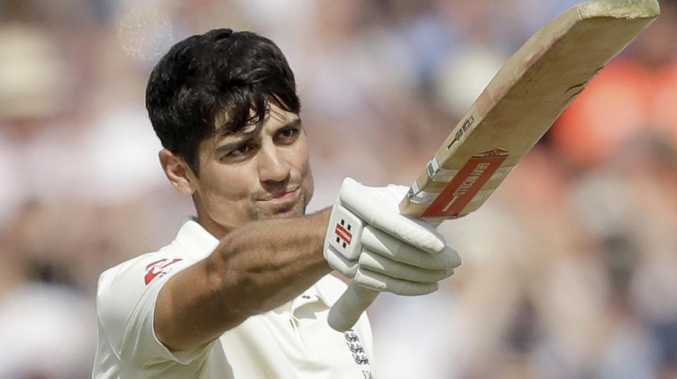 With 12,742 runs to his name at an average of 45.35, Cook will retire as the highest-scoring left-hander in Test history. 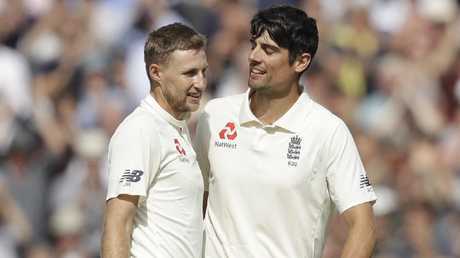 The hundred was Cook's 33rd and he was not the only man to celebrate a ton, with captain Joe Root ending his year-long Test century drought by making 125 in the final innings of the series against India. England declared its innings at 8-423, setting India a target of 464 to win. The tourists limped to stumps to 3-58 after James Anderson removed Shikhar Dhawan (1) and Cheteshwar Pujara (0) in the third over, and Stuart Broad had Virat Kohli (0) caught behind for a golden duck. KL Rahul (46) and Ajinkya Rahane (10) were the not out batsmen at the close of play.